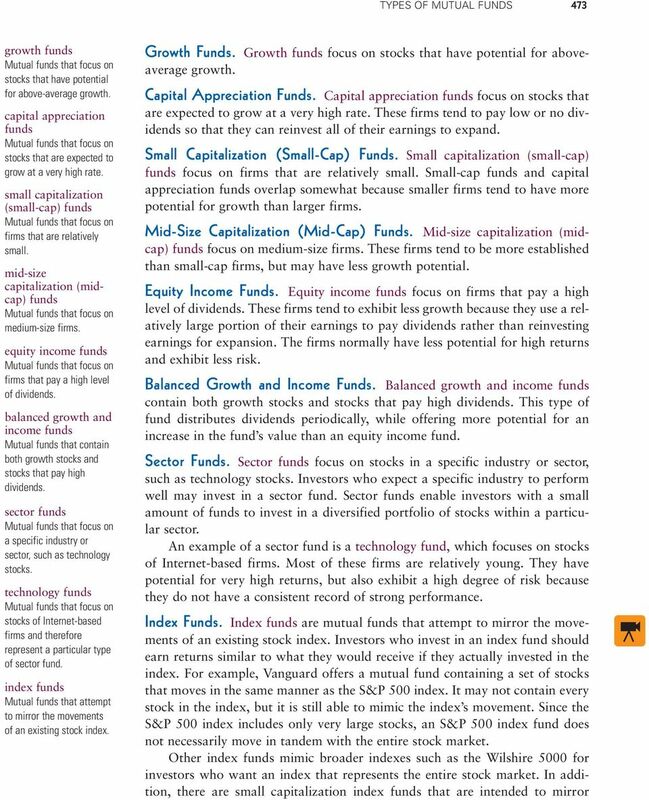 Download "Investing in Mutual Funds"
2 468 I N V E S T I N G I N M U T U A L F U N D S her share of the gains. Too late, Barb realized that most mutual funds distribute their gains, as they are required to do so by law, near the end of the year. 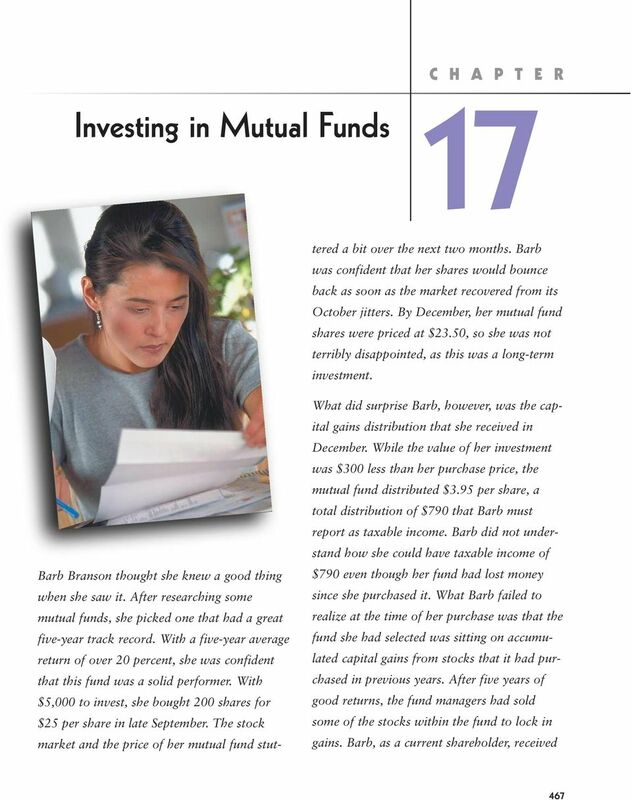 Barb has more to learn about mutual funds and their tax implications. Mutual funds pool money from you and other investors to purchase portfolios of securities. 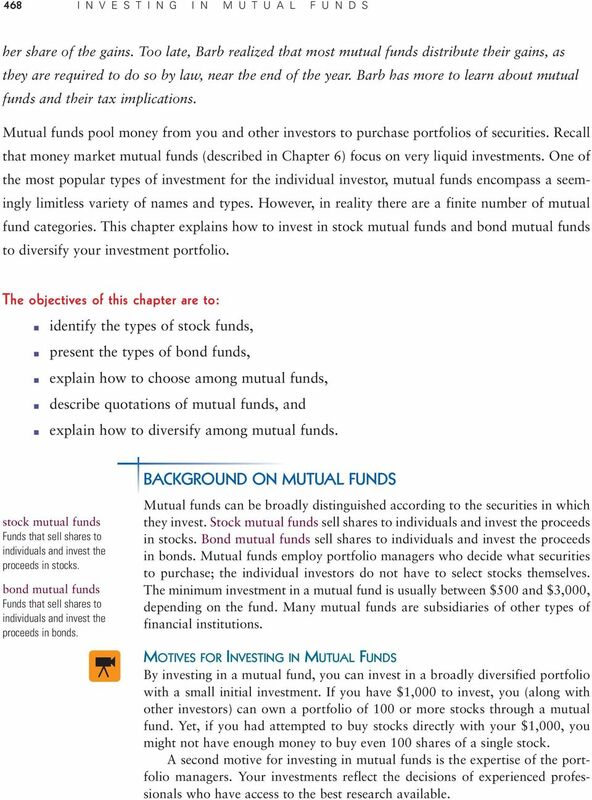 Recall that money market mutual funds (described in Chapter 6) focus on very liquid investments. One of the most popular types of investment for the individual investor, mutual funds encompass a seemingly limitless variety of names and types. However, in reality there are a finite number of mutual fund categories. 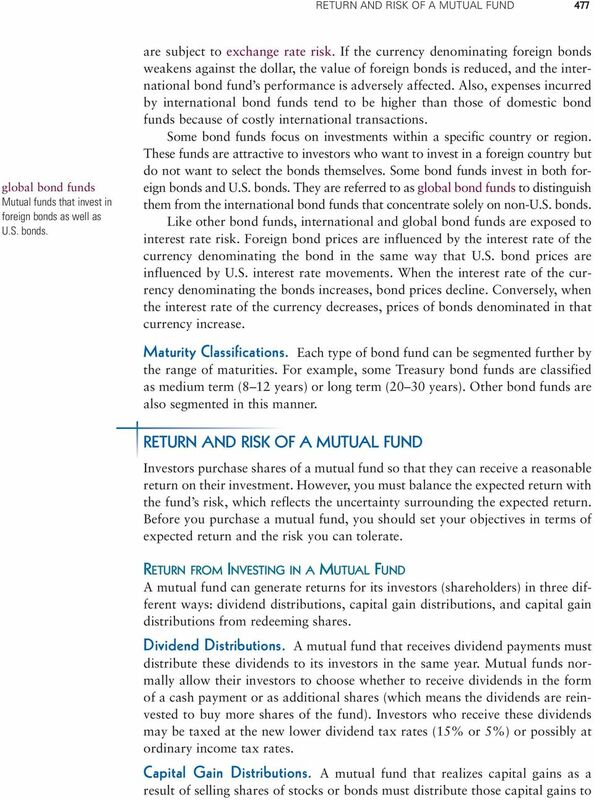 This chapter explains how to invest in stock mutual funds and bond mutual funds to diversify your investment portfolio. 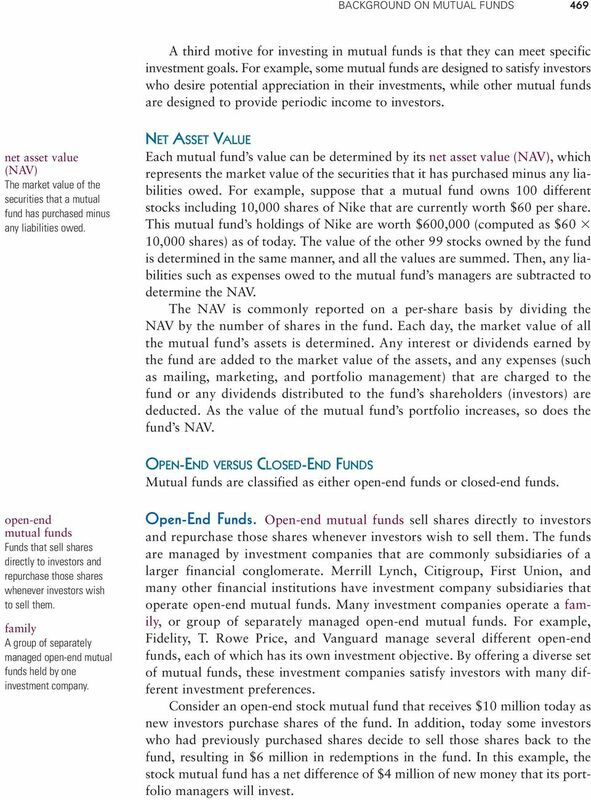 The objectives of this chapter are to: identify the types of stock funds, present the types of bond funds, explain how to choose among mutual funds, describe quotations of mutual funds, and explain how to diversify among mutual funds. stock mutual funds Funds that sell shares to individuals and invest the proceeds in stocks. 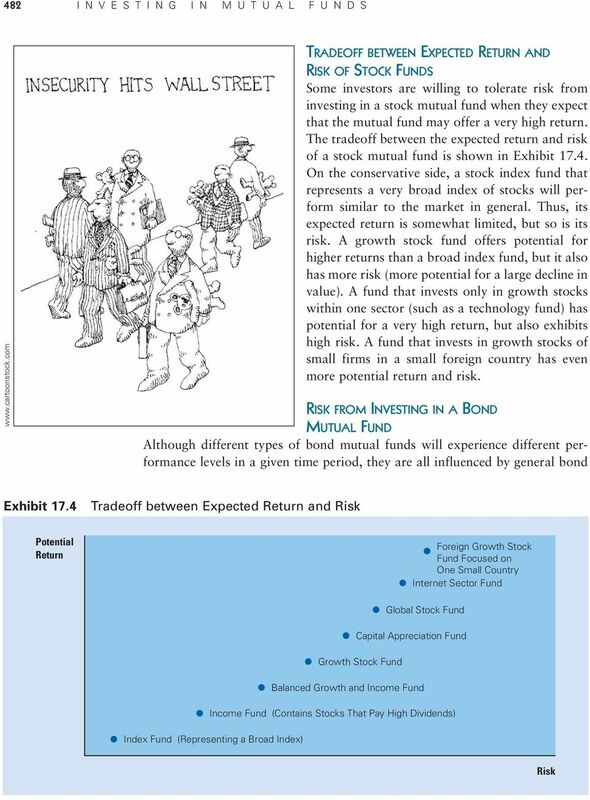 bond mutual funds Funds that sell shares to individuals and invest the proceeds in bonds. BACKGROUND ON MUTUAL FUNDS Mutual funds can be broadly distinguished according to the securities in which they invest. Stock mutual funds sell shares to individuals and invest the proceeds in stocks. Bond mutual funds sell shares to individuals and invest the proceeds in bonds. Mutual funds employ portfolio managers who decide what securities to purchase; the individual investors do not have to select stocks themselves. The minimum investment in a mutual fund is usually between $500 and $3,000, depending on the fund. Many mutual funds are subsidiaries of other types of financial institutions. MOTIVES FOR INVESTING IN MUTUAL FUNDS By investing in a mutual fund, you can invest in a broadly diversified portfolio with a small initial investment. If you have $1,000 to invest, you (along with other investors) can own a portfolio of 100 or more stocks through a mutual fund. Yet, if you had attempted to buy stocks directly with your $1,000, you might not have enough money to buy even 100 shares of a single stock. A second motive for investing in mutual funds is the expertise of the portfolio managers. Your investments reflect the decisions of experienced professionals who have access to the best research available. 3 BACKGROUND ON MUTUAL FUNDS 469 A third motive for investing in mutual funds is that they can meet specific investment goals. For example, some mutual funds are designed to satisfy investors who desire potential appreciation in their investments, while other mutual funds are designed to provide periodic income to investors. net asset value (NAV) The market value of the securities that a mutual fund has purchased minus any liabilities owed. NET ASSET VALUE Each mutual fund s value can be determined by its net asset value (NAV), which represents the market value of the securities that it has purchased minus any liabilities owed. For example, suppose that a mutual fund owns 100 different stocks including 10,000 shares of Nike that are currently worth $60 per share. This mutual fund s holdings of Nike are worth $600,000 (computed as $60 10,000 shares) as of today. The value of the other 99 stocks owned by the fund is determined in the same manner, and all the values are summed. Then, any liabilities such as expenses owed to the mutual fund s managers are subtracted to determine the NAV. The NAV is commonly reported on a per-share basis by dividing the NAV by the number of shares in the fund. Each day, the market value of all the mutual fund s assets is determined. Any interest or dividends earned by the fund are added to the market value of the assets, and any expenses (such as mailing, marketing, and portfolio management) that are charged to the fund or any dividends distributed to the fund s shareholders (investors) are deducted. As the value of the mutual fund s portfolio increases, so does the fund s NAV. OPEN-END VERSUS CLOSED-END FUNDS Mutual funds are classified as either open-end funds or closed-end funds. open-end mutual funds Funds that sell shares directly to investors and repurchase those shares whenever investors wish to sell them. family A group of separately managed open-end mutual funds held by one investment company. Open-End Funds. Open-end mutual funds sell shares directly to investors and repurchase those shares whenever investors wish to sell them. The funds are managed by investment companies that are commonly subsidiaries of a larger financial conglomerate. Merrill Lynch, Citigroup, First Union, and many other financial institutions have investment company subsidiaries that operate open-end mutual funds. Many investment companies operate a family, or group of separately managed open-end mutual funds. For example, Fidelity, T. Rowe Price, and Vanguard manage several different open-end funds, each of which has its own investment objective. By offering a diverse set of mutual funds, these investment companies satisfy investors with many different investment preferences. Consider an open-end stock mutual fund that receives $10 million today as new investors purchase shares of the fund. In addition, today some investors who had previously purchased shares decide to sell those shares back to the fund, resulting in $6 million in redemptions in the fund. In this example, the stock mutual fund has a net difference of $4 million of new money that its portfolio managers will invest. 4 470 I N V E S T I N G I N M U T U A L F U N D S closed-end funds Funds that sell shares to investors but do not repurchase them; instead fund shares are purchased and sold on stock exchanges. premium The amount by which a closed-end fund s share price in the secondary market is above the fund s NAV. discount The amount by which a closed-end fund s share price in the secondary market is below the fund s NAV. no-load mutual funds Funds that sell directly to investors and do not charge a fee. load mutual funds Funds whose shares are sold by a stockbroker who charges a fee (or load) for the transaction. On some days, the value of redemptions may exceed the value of new shares purchased. Mutual fund managers typically maintain a small portion of the fund s portfolio in the form of cash or marketable securities so that they have sufficient liquidity when redemptions exceed new share purchases. Otherwise, they could sell some stocks in their portfolio to obtain the necessary money for redemptions. Closed-End Funds. Closed-end funds issue shares to investors when the funds are first created, but do not repurchase shares from investors. Unlike an openend fund, shares of a closed-end fund are purchased and sold on stock exchanges. Thus, the fund does not sell new shares upon demand to investors and does not allow investors to redeem shares. The market price per share is determined by the demand for shares versus the supply of shares that are being sold. The price per share of a closed-end fund can differ from the fund s NAV per share. A closed-end fund s share price may exhibit a premium (above the NAV) in some periods and a discount (below the NAV) in other periods. 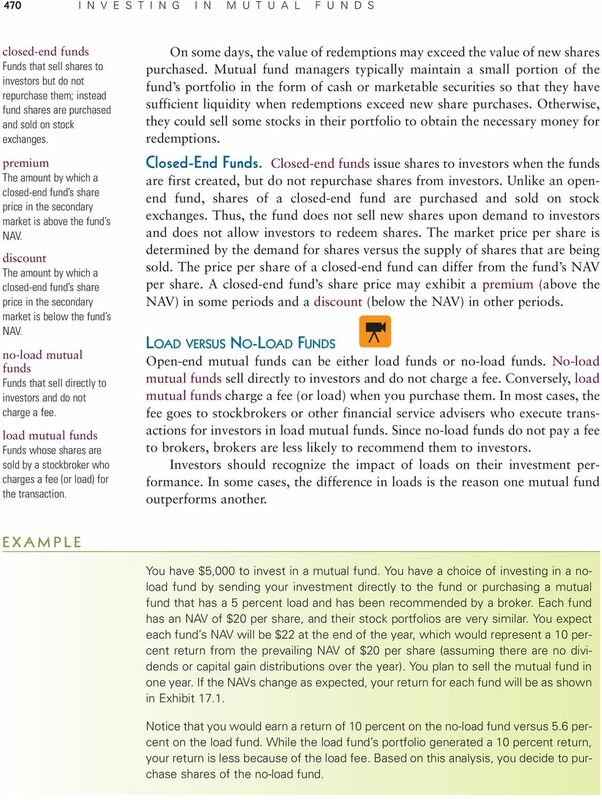 LOAD VERSUS NO-LOAD FUNDS Open-end mutual funds can be either load funds or no-load funds. No-load mutual funds sell directly to investors and do not charge a fee. Conversely, load mutual funds charge a fee (or load) when you purchase them. In most cases, the fee goes to stockbrokers or other financial service advisers who execute transactions for investors in load mutual funds. Since no-load funds do not pay a fee to brokers, brokers are less likely to recommend them to investors. Investors should recognize the impact of loads on their investment performance. In some cases, the difference in loads is the reason one mutual fund outperforms another. EXAMPLE You have $5,000 to invest in a mutual fund. You have a choice of investing in a noload fund by sending your investment directly to the fund or purchasing a mutual fund that has a 5 percent load and has been recommended by a broker. Each fund has an NAV of $20 per share, and their stock portfolios are very similar. You expect each fund s NAV will be $22 at the end of the year, which would represent a 10 percent return from the prevailing NAV of $20 per share (assuming there are no dividends or capital gain distributions over the year). You plan to sell the mutual fund in one year. If the NAVs change as expected, your return for each fund will be as shown in Exhibit Notice that you would earn a return of 10 percent on the no-load fund versus 5.6 percent on the load fund. While the load fund s portfolio generated a 10 percent return, your return is less because of the load fee. Based on this analysis, you decide to purchase shares of the no-load fund. 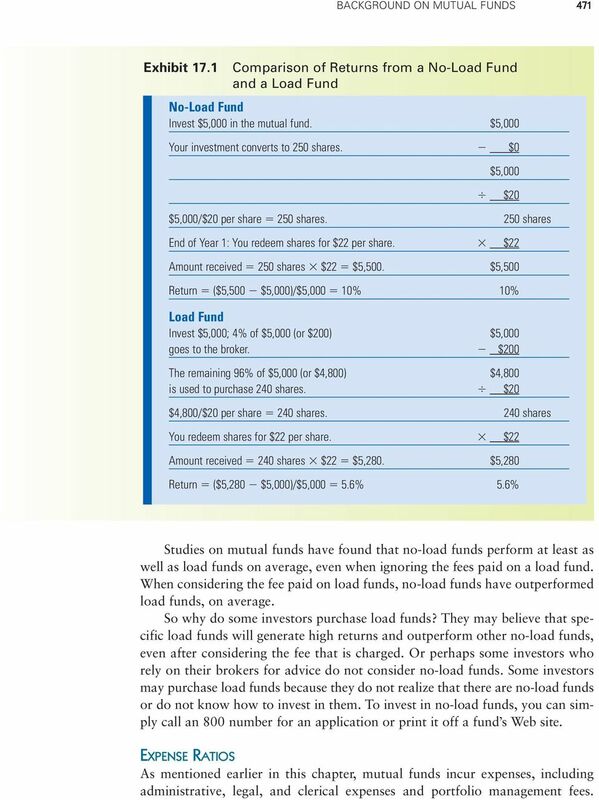 5 BACKGROUND ON MUTUAL FUNDS 471 Exhibit 17.1 Comparison of Returns from a No-Load Fund and a Load Fund No-Load Fund Invest $5,000 in the mutual fund. $5,000 Your investment converts to 250 shares. $0 $5,000 $20 $5,000/$20 per share 250 shares. 250 shares End of Year 1: You redeem shares for $22 per share. $22 Amount received 250 shares $22 $5,500. $5,500 Return ($5,500 $5,000)/$5,000 10% 10% Load Fund Invest $5,000; 4% of $5,000 (or $200) $5,000 goes to the broker. $200 The remaining 96% of $5,000 (or $4,800) $4,800 is used to purchase 240 shares. $20 $4,800/$20 per share 240 shares. 240 shares You redeem shares for $22 per share. $22 Amount received 240 shares $22 $5,280. $5,280 Return ($5,280 $5,000)/$5, % 5.6% Studies on mutual funds have found that no-load funds perform at least as well as load funds on average, even when ignoring the fees paid on a load fund. When considering the fee paid on load funds, no-load funds have outperformed load funds, on average. So why do some investors purchase load funds? They may believe that specific load funds will generate high returns and outperform other no-load funds, even after considering the fee that is charged. Or perhaps some investors who rely on their brokers for advice do not consider no-load funds. Some investors may purchase load funds because they do not realize that there are no-load funds or do not know how to invest in them. To invest in no-load funds, you can simply call an 800 number for an application or print it off a fund s Web site. 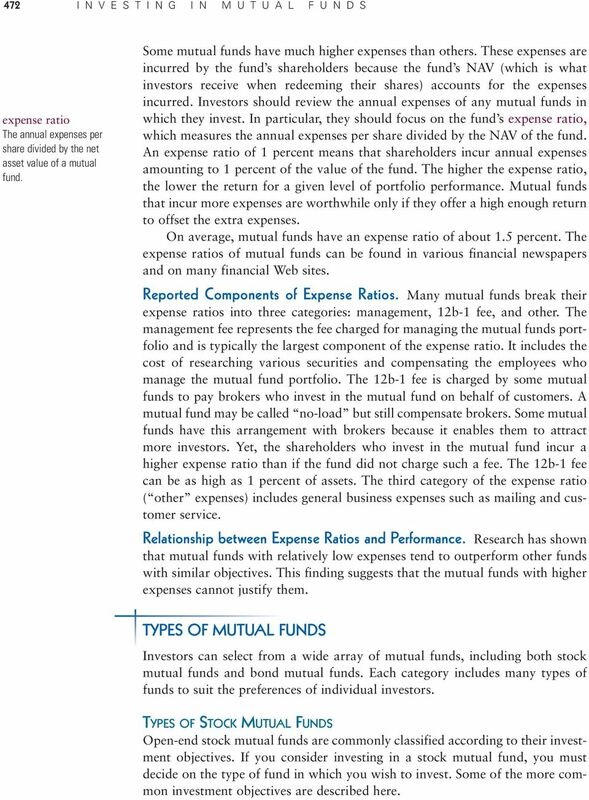 EXPENSE RATIOS As mentioned earlier in this chapter, mutual funds incur expenses, including administrative, legal, and clerical expenses and portfolio management fees. 6 472 I N V E S T I N G I N M U T U A L F U N D S expense ratio The annual expenses per share divided by the net asset value of a mutual fund. Some mutual funds have much higher expenses than others. These expenses are incurred by the fund s shareholders because the fund s NAV (which is what investors receive when redeeming their shares) accounts for the expenses incurred. Investors should review the annual expenses of any mutual funds in which they invest. In particular, they should focus on the fund s expense ratio, which measures the annual expenses per share divided by the NAV of the fund. An expense ratio of 1 percent means that shareholders incur annual expenses amounting to 1 percent of the value of the fund. The higher the expense ratio, the lower the return for a given level of portfolio performance. Mutual funds that incur more expenses are worthwhile only if they offer a high enough return to offset the extra expenses. On average, mutual funds have an expense ratio of about 1.5 percent. The expense ratios of mutual funds can be found in various financial newspapers and on many financial Web sites. Reported Components of Expense Ratios. Many mutual funds break their expense ratios into three categories: management, 12b-1 fee, and other. 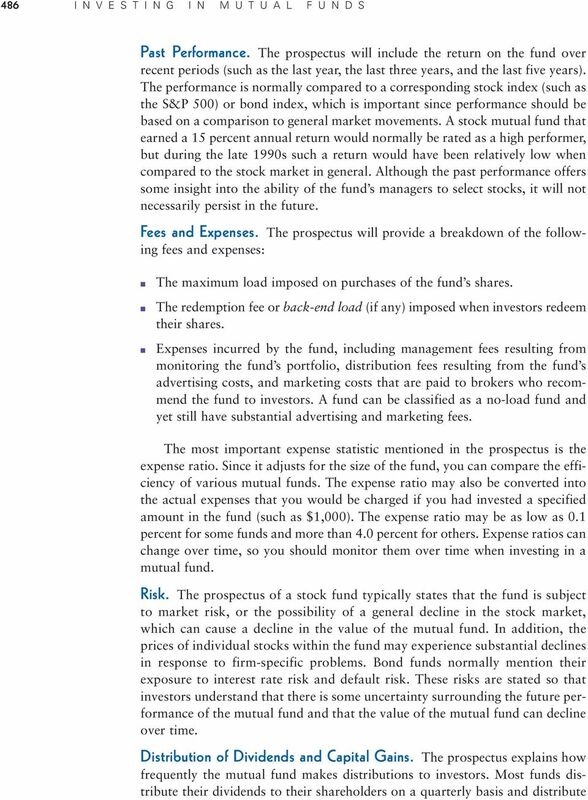 The management fee represents the fee charged for managing the mutual funds portfolio and is typically the largest component of the expense ratio. It includes the cost of researching various securities and compensating the employees who manage the mutual fund portfolio. The 12b-1 fee is charged by some mutual funds to pay brokers who invest in the mutual fund on behalf of customers. A mutual fund may be called no-load but still compensate brokers. Some mutual funds have this arrangement with brokers because it enables them to attract more investors. Yet, the shareholders who invest in the mutual fund incur a higher expense ratio than if the fund did not charge such a fee. The 12b-1 fee can be as high as 1 percent of assets. The third category of the expense ratio ( other expenses) includes general business expenses such as mailing and customer service. Relationship between Expense Ratios and Performance. Research has shown that mutual funds with relatively low expenses tend to outperform other funds with similar objectives. This finding suggests that the mutual funds with higher expenses cannot justify them. TYPES OF MUTUAL FUNDS Investors can select from a wide array of mutual funds, including both stock mutual funds and bond mutual funds. Each category includes many types of funds to suit the preferences of individual investors. TYPES OF STOCK MUTUAL FUNDS Open-end stock mutual funds are commonly classified according to their investment objectives. If you consider investing in a stock mutual fund, you must decide on the type of fund in which you wish to invest. Some of the more common investment objectives are described here. 8 474 I N V E S T I N G I N M U T U A L F U N D S EXAMPLE movements in the small-cap index. Other index funds mimic foreign stock indexes, such as a European index and a Pacific Basin index. Investors who want to invest in a particular country, but do not want to incur excessive expenses associated with foreign stock exchanges, can invest in an index fund targeted to that country. Index funds have become very popular because of their performance relative to other mutual funds. They incur less expenses than a typical mutual fund because they are not actively managed. The index fund does not incur expenses for researching various stocks because it is intended simply to mimic an index. In addition, the fund s portfolio is not frequently revised. Consequently, index funds incur very low transaction costs, which can enhance performance. Some index funds have expense ratios of between 0.20 and 0.30 percent, which is substantially lower than the expense ratios of most other mutual funds. Index funds can also offer tax advantages. Since they engage in less trading than most other mutual funds, they generate a limited amount of capital gains that must be distributed to shareholders. Those index funds composed of stocks that do not pay dividends are especially valuable because they do not have dividend income that must be distributed to shareholders. Much research has found that the performance of portfolios managed by portfolio managers is frequently lower than the performance of an existing stock index. Thus, investors may be better off investing in an index fund rather than investing in an actively managed portfolio. You consider investing in either a no-load mutual fund that focuses on growth stocks or an index mutual fund. When ignoring expenses incurred by the mutual funds, you expect that the growth fund will generate an annual return of 9 percent versus an annual return of 8 percent for the index fund. The growth fund has an expense ratio of 1.5 percent, versus an expense ratio of 0.2 percent for the index fund. 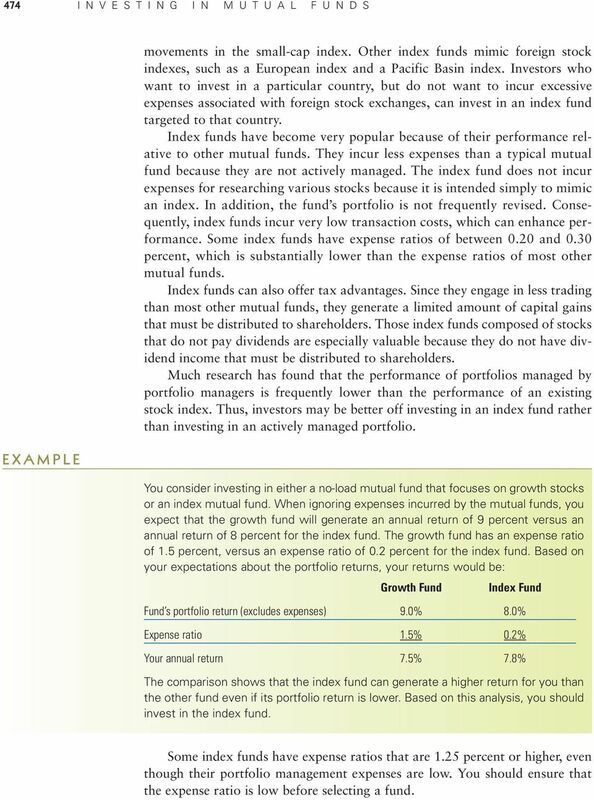 Based on your expectations about the portfolio returns, your returns would be: Growth Fund Index Fund Fund s portfolio return (excludes expenses) 9.0% 8.0% Expense ratio 1.5% 0.2% Your annual return 7.5% 7.8% The comparison shows that the index fund can generate a higher return for you than the other fund even if its portfolio return is lower. Based on this analysis, you should invest in the index fund. Some index funds have expense ratios that are 1.25 percent or higher, even though their portfolio management expenses are low. You should ensure that the expense ratio is low before selecting a fund. 13 RETURN AND RISK OF A MUTUAL FUND 479 Even though the funds distributed the same amount to you, your taxes on the Index Fund distributions are $117 lower. 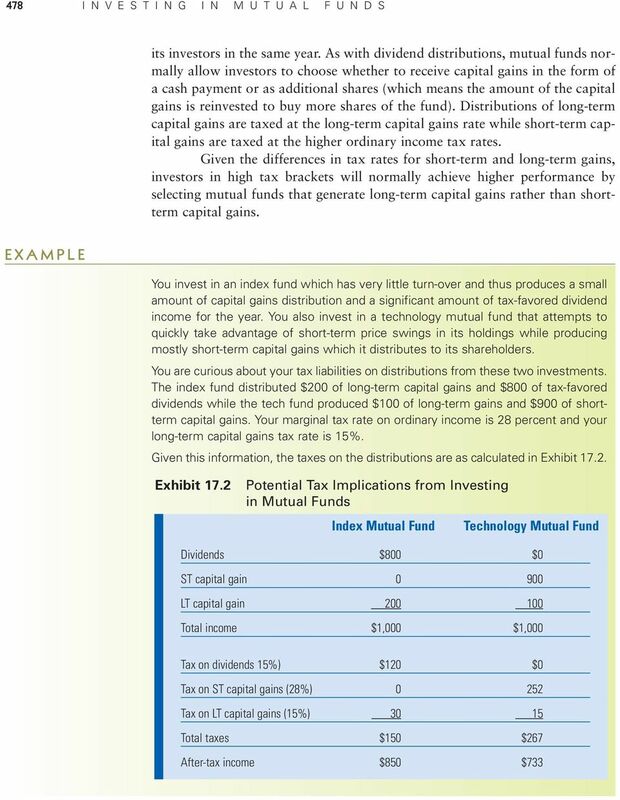 Thus, your after-tax income from that fund is $117 higher than your income from the tech fund, as shown in Exhibit As the above example illustrates, individuals in higher tax brackets can reduce their tax liability by investing in mutual funds with low dividend distributions. Capital Gain from Redeeming Shares. You earn a capital gain if you redeem shares of a mutual fund when the share price exceeds the price at which you purchased the shares. For example, if you purchase 200 shares of a stock mutual fund at a price of $25 per share and sell the shares for $30, your capital gain will be: Capital Gain (Selling Price per Share Purchase Price per Share) Number of Shares ($30 $25) 200 $1,000. If you held the shares for more than one year, you have a long-term capital gain. If you held them for one year or less, your gain is subject to your ordinary income tax rate Financial Planning Online: Return from Investing in Mutual Funds Go to: markets/mutualfunds/index.html This Web site provides: information on the top 25 mutual funds in the United States as well as several foreign countries. 14 480 I N V E S T I N G I N M U T U A L F U N D S Determining your capital gain is more difficult when you have reinvested distributions in the fund, because each distribution results in the purchase of more shares at the prevailing price on that day. The capital gain on the shares purchased at the time of the distribution is dependent on the price you paid for them. Many investors rely on the mutual fund to report their capital gain after they redeem the shares. Now that many mutual fund companies allow you to review your account online, finding price information has been simplified. COMPARING RETURNS AMONG STOCK MUTUAL FUNDS The mean returns for various types of mutual funds in 1999 are summarized in the top panel of Exhibit The exhibit shows how the return over a particular time period can vary substantially among types of mutual funds. Notice that mutual funds in the science and technology sector generated a mean annual return of 135 percent, while the equity income funds generated a mean return of only 4 percent. 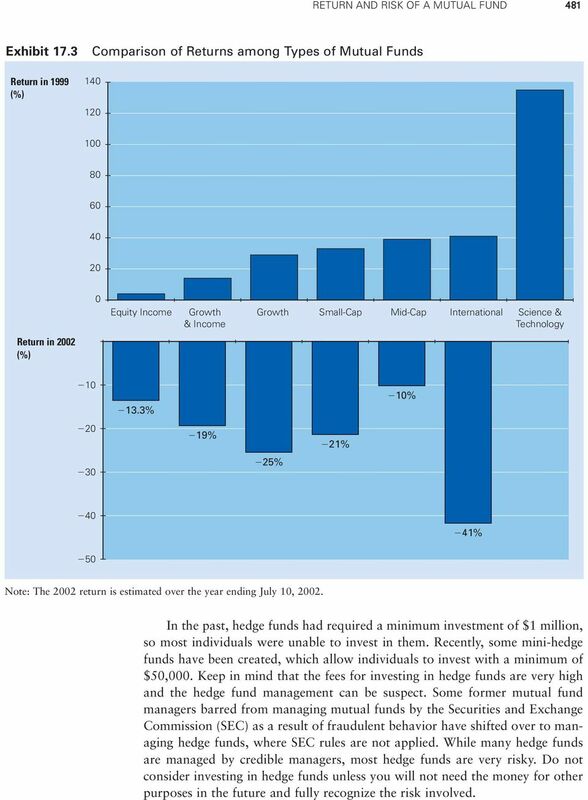 Notice how these funds performed in 2002, as shown in the bottom panel. All mutual funds were weak in this period, which provides an important lesson. When the stock market performs very poorly, mutual funds tend to perform poorly as well. While the funds are diversified, they still generate losses in periods when most of the stocks that they invest in exhibit losses. Notice that the science and technology funds performed worse than others during this period. A comparison of the two panels in Exhibit 17.3 shows how sector funds have the potential to offer very high returns but also have a high degree of risk. market risk The susceptibility of a mutual fund s performance to general stock market conditions. hedge funds Limited partnerships that manage portfolios of funds for wealthy individuals and financial institutions. RISK FROM INVESTING IN A STOCK MUTUAL FUND Although different types of stock mutual funds experience different performance levels in a given time period, they are all influenced by general stock market conditions. The performance of a stock mutual fund is dependent on the general movements in stock prices. When the stock market is weak, prices of stocks held by a stock fund decrease, and the NAV of the fund declines as well. This susceptibility to the stock market is often referred to as market risk. Focus on Ethics: Risk from Investing in Hedge Funds. Hedge funds sell shares to wealthy individuals and financial institutions and use the proceeds to invest in various securities. In this way, they serve a similar purpose to mutual funds. Yet they are structured as limited partnerships in which investors have little or no control of the company s management. Also note that hedge funds are not regulated by the SEC. While they strive to earn very high returns, they tend to make very risky investments that can lead to extremely poor returns. Hedge funds may invest not only in risky stocks, but in a wide variety of investments including silver or other metals. They may take a short position in a stock by selling thousands of shares of a stock that it does not own. If this stock s price declines, the funds will earn a high return. But if the stock s price rises, it will experience a large loss. Hedge funds also commonly buy stocks on margin by supporting their investment with borrowed funds. This strategy will increase the magnitude of the gain or the loss on the investment. 15 RETURN AND RISK OF A MUTUAL FUND 481 Exhibit 17.3 Return in 1999 (%) Comparison of Returns among Types of Mutual Funds Equity Income Growth & Income Growth Small-Cap Mid-Cap International Science & Technology Return in 2002 (%) % 10% 20 19% 21% 30 25% 40 41% 50 Note: The 2002 return is estimated over the year ending July 10, In the past, hedge funds had required a minimum investment of $1 million, so most individuals were unable to invest in them. Recently, some mini-hedge funds have been created, which allow individuals to invest with a minimum of $50,000. Keep in mind that the fees for investing in hedge funds are very high and the hedge fund management can be suspect. Some former mutual fund managers barred from managing mutual funds by the Securities and Exchange Commission (SEC) as a result of fraudulent behavior have shifted over to managing hedge funds, where SEC rules are not applied. While many hedge funds are managed by credible managers, most hedge funds are very risky. Do not consider investing in hedge funds unless you will not need the money for other purposes in the future and fully recognize the risk involved. 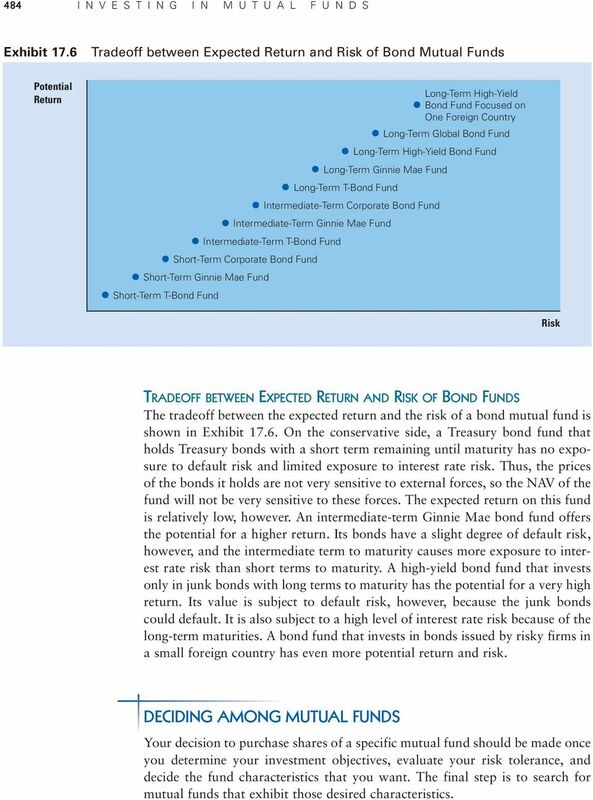 18 484 I N V E S T I N G I N M U T U A L F U N D S Exhibit 17.6 Tradeoff between Expected Return and Risk of Bond Mutual Funds Potential Return Short-Term T-Bond Fund Long-Term High-Yield Bond Fund Focused on One Foreign Country Long-Term Global Bond Fund Long-Term High-Yield Bond Fund Long-Term Ginnie Mae Fund Long-Term T-Bond Fund Intermediate-Term Corporate Bond Fund Intermediate-Term Ginnie Mae Fund Intermediate-Term T-Bond Fund Short-Term Corporate Bond Fund Short-Term Ginnie Mae Fund Risk TRADEOFF BETWEEN EXPECTED RETURN AND RISK OF BOND FUNDS The tradeoff between the expected return and the risk of a bond mutual fund is shown in Exhibit On the conservative side, a Treasury bond fund that holds Treasury bonds with a short term remaining until maturity has no exposure to default risk and limited exposure to interest rate risk. Thus, the prices of the bonds it holds are not very sensitive to external forces, so the NAV of the fund will not be very sensitive to these forces. The expected return on this fund is relatively low, however. An intermediate-term Ginnie Mae bond fund offers the potential for a higher return. 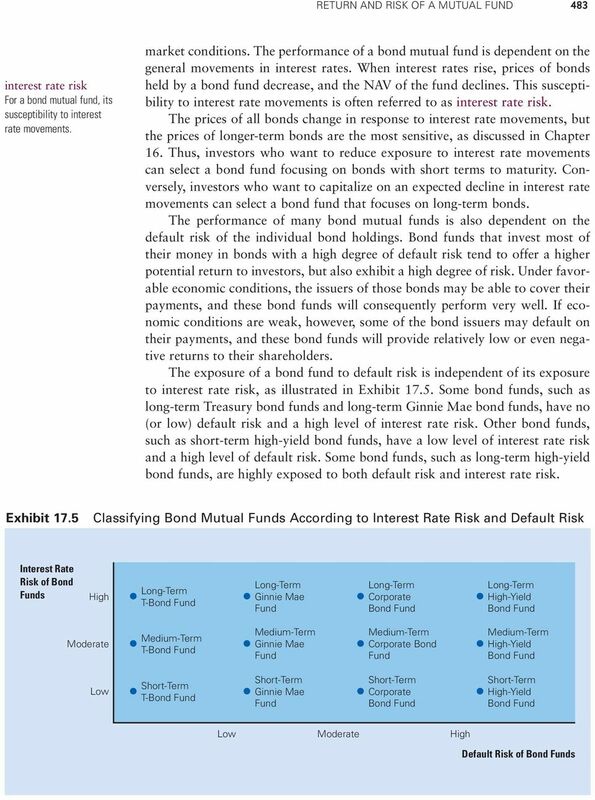 Its bonds have a slight degree of default risk, however, and the intermediate term to maturity causes more exposure to interest rate risk than short terms to maturity. A high-yield bond fund that invests only in junk bonds with long terms to maturity has the potential for a very high return. Its value is subject to default risk, however, because the junk bonds could default. It is also subject to a high level of interest rate risk because of the long-term maturities. A bond fund that invests in bonds issued by risky firms in a small foreign country has even more potential return and risk. DECIDING AMONG MUTUAL FUNDS Your decision to purchase shares of a specific mutual fund should be made once you determine your investment objectives, evaluate your risk tolerance, and decide the fund characteristics that you want. The final step is to search for mutual funds that exhibit those desired characteristics. 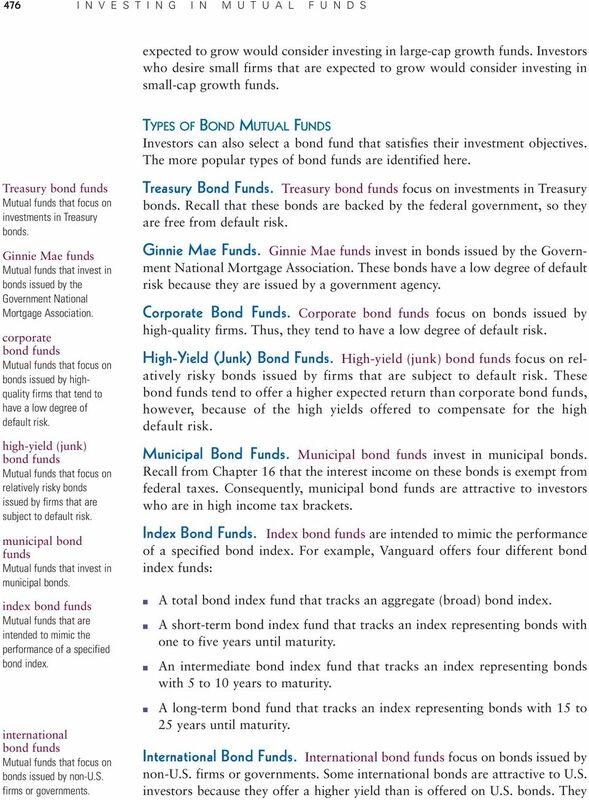 19 DECIDING AMONG MUTUAL FUNDS 485 DETERMINING YOUR PREFERRED MUTUAL FUND CHARACTERISTICS When identifying the type of mutual fund you want, you will want to consider various fund characteristics. Minimum Initial Investment. If you have a relatively small amount to invest (such as $1,000), you should limit your choices to mutual funds whose initial investment is equal to or below that level. Many funds allow an even smaller initial investment if the account is funded with a systematic investment plan, whereby you make a regular monthly investment in your account. Investment Objective (Type of Fund). You must identify your investment goals. First, determine whether you are interested in a stock mutual fund or a bond mutual fund. If you want your investment to have high potential for increasing in value over time, you should consider capital appreciation funds. If you want periodic income, you should consider bond funds. Once you select a stock fund or a bond fund, you should select the particular type of fund that will match your investment objective. Funds vary according to their potential return and their risk, as mentioned earlier. Investment Company. Whatever your investment objective, there are probably many investment companies that offer a suitable fund. One way to choose an investment company is by assessing the past performance of the type of mutual funds you are considering. Past performance is not necessarily a good indicator of future performance, however. A better approach may be to compare fees and expenses on the funds you are considering. You may want to screen your list of funds by removing the load funds from consideration. In addition, you should compare the funds expense ratios, since some investment companies charge much lower expenses than others. 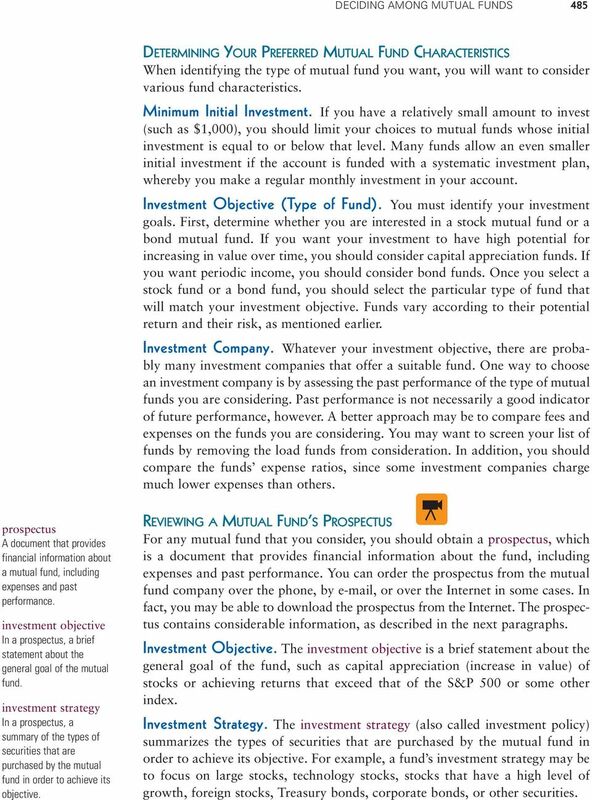 prospectus A document that provides financial information about a mutual fund, including expenses and past performance. investment objective In a prospectus, a brief statement about the general goal of the mutual fund. investment strategy In a prospectus, a summary of the types of securities that are purchased by the mutual fund in order to achieve its objective. REVIEWING A MUTUAL FUND S PROSPECTUS For any mutual fund that you consider, you should obtain a prospectus, which is a document that provides financial information about the fund, including expenses and past performance. 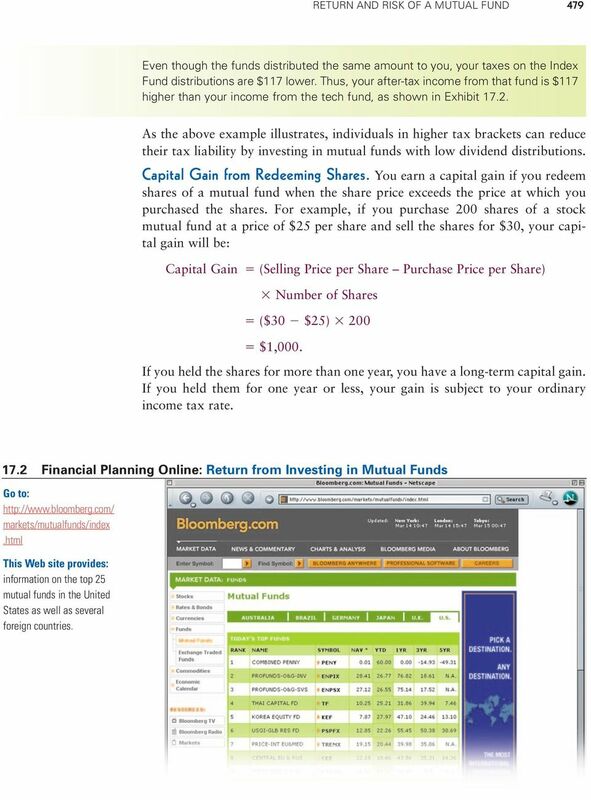 You can order the prospectus from the mutual fund company over the phone, by , or over the Internet in some cases. In fact, you may be able to download the prospectus from the Internet. The prospectus contains considerable information, as described in the next paragraphs. Investment Objective. The investment objective is a brief statement about the general goal of the fund, such as capital appreciation (increase in value) of stocks or achieving returns that exceed that of the S&P 500 or some other index. Investment Strategy. The investment strategy (also called investment policy) summarizes the types of securities that are purchased by the mutual fund in order to achieve its objective. For example, a fund s investment strategy may be to focus on large stocks, technology stocks, stocks that have a high level of growth, foreign stocks, Treasury bonds, corporate bonds, or other securities. 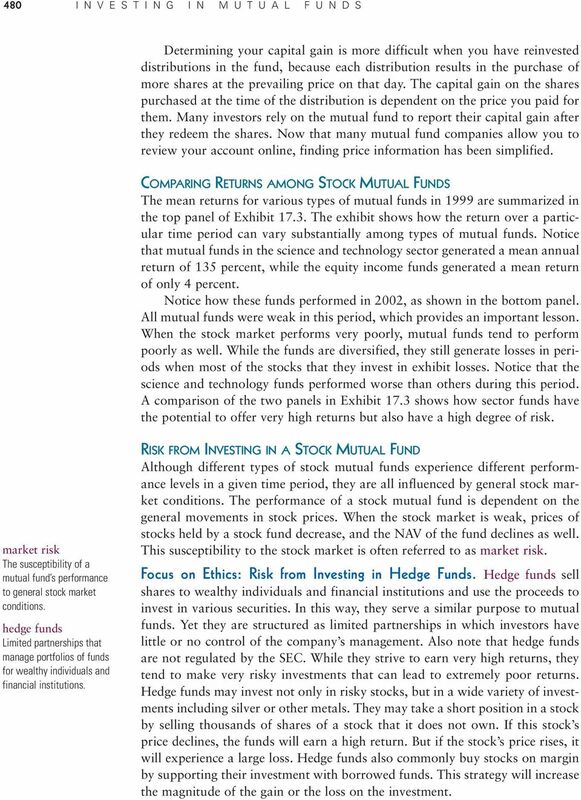 21 DECIDING AMONG MUTUAL FUNDS Financial Planning Online: Mutual Fund Reports Go to: Click on: Funds. 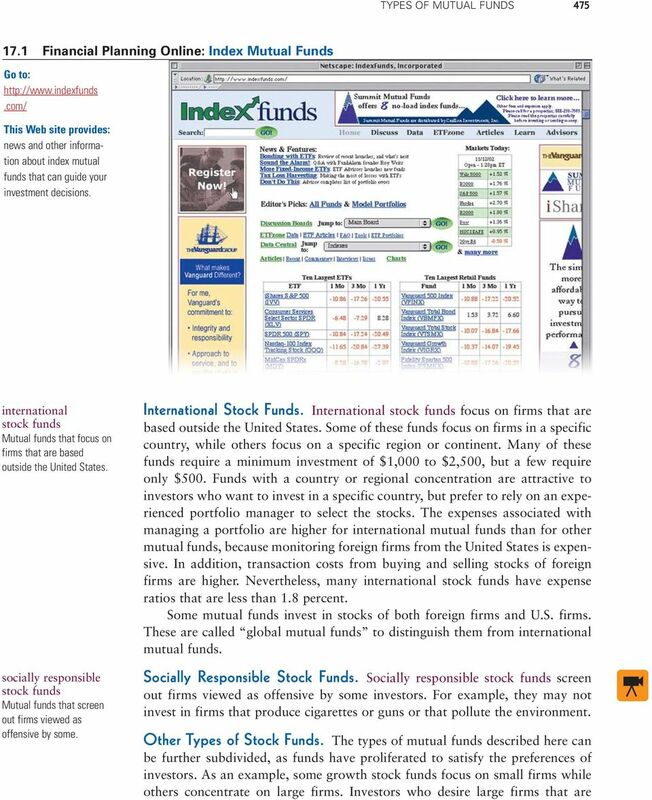 This Web site provides: a report for a mutual fund that you specify. This report allows you to review key characteristics about the fund, including its performance and expenses. their capital gains once a year (usually in December). The prospectus also describes the means by which dividends and capital gains are distributed. Minimum Investment and Minimum Balance. The prospectus states the minimum investment that can be made in the fund. In addition, it may require that you maintain a minimum balance, as it is costly for a fund to maintain an account that has a very small balance. How to Buy or Redeem Shares. The prospectus explains how you can invest in the fund by sending in a check along with a completed application form (which is normally attached to the prospectus). If the mutual fund is part of a family of funds operated by a single investment company, the prospectus explains how you can call the investment company to transfer money from one fund to another within the family. The prospectus also explains how you can sell your shares back to the mutual fund. Normally you can send a letter asking the fund to redeem your shares. In some cases, you may be able to call the investment company to redeem your shares. MAKING THE DECISION Once you have screened your list down to a small number of possible mutual funds, you can create a table to compare the important characteristics. This process will help you select the mutual fund that will best satisfy your preferences.